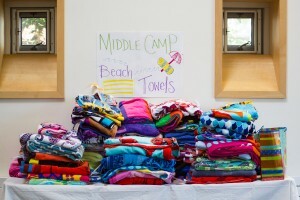 For over six weeks, Beaver campers flocked to our Camp to Belong tables with much-needed items. As they walked through the foyer of the arts wing, campers were able to watch as the hills turned into mountains of pillows, sleeping bags, flashlights, duffel bags, beach towels and gift cards supplied by campers’ families. Sibling Connections is continually grateful for the families at Beaver Summer Camp. Once again, your community was able to provide an overflowing amount of sleeping bags, pillows, flashlights, towels, gift cards, and birthday store presents for our campers. All items were used and appreciated by our campers. As you can imagine many of our campers move between multiple homes and lose many of their personal belongings. Your donation provides our campers with items they often do not own and they are extremely grateful to leave camp with their own camping gear. Thank you for being apart of our mission to support siblings separated by foster care. This summer we were able to send 92 campers to Camp To Belong MA and we thank you for your ongoing efforts to support our brothers and sisters.